The aspect of Raskulls that stands out the most is its unique combination of platforming, puzzle solving, and racing. What at first looks like a fairly simple concept quickly becomes a devious test of skill and wit as you try to beat your opponents to the finish line. With so many aspects to ponder (the fastest route, the best blocks to destroy, when to run and when to wait, frenzy, power-ups, and more) there%26rsquo;s always something else to take into consideration. The core gameplay in Raskulls involves simply racing to the finish line before your opponent. That becomes more complicated, however, due to the giant blocks that stand in your way. Each Raskull is given a wand to deal with these which is used to blast blocks out of your way. Now, you can simply blast every individual one that%26rsquo;s in front of you, but this is incredibly slow and won%26rsquo;t help you win the race. The trick is that blocks of the same color combine to create bigger blocks. Therefore you want to blast big blocks and any blocks that are preventing two of the same color from joining. The better you do this the faster you will clear a route to the finish line. Some blocks take multiple zaps from your wand to destroy, but also self-destruct upon contact with others of their kind, so obviously for these you%26rsquo;ll want to cause them to combine instead. Or you can simply charge through them with the kart racer style power-ups you can find along the track. These power-ups (along with your wand) can also be used to impede your opponents%26rsquo; progress in various ways. The final element is your frenzy meter which increases when you collect small orbs that appear from destroyed blocks (more orbs appear for bigger blocks), spending time in specially marked frenzy zones, or collecting jars of orbs on the track. When activated, Frenzy gives boost to your movement and zapping speed. The duration of this boost is directly related to how full your meter is. While that level of depth might be enough for some Live Arcade titles, Raskulls takes it further by including ten different game types. Each one requires its own set of tactics and skills, which make you consider how you approach events carefully. Luckily, throughout almost the entire Mega Quest (the main campaign) you will be offered the choice between two or more different events. This is truly a great feature as it allows you to play the game your way, and helps you to avoid getting stuck. You can always complete the events you missed afterwards (completing them all will net you an achievement). The flip side of the ability to choose the events you%26rsquo;re good at is that it can make the campaign substantially easier. Now while this might not bother everyone (and can be avoided by simply choosing the events you%26rsquo;re bad at) it can make the Mega Quest a bit of a cakewalk that you%26rsquo;ll likely finish in one sitting. You will be enthralled the entire way through, though, because Raskulls maintains a surprisingly high level of energy. Even when you choose a slower, puzzle-heavy event the level of concentration required to successfully complete it will keep you utterly focused on what you%26rsquo;re doing. While this is entirely true of the single-player the same cannot be said of the multiplayer offerings. While Raskulls does offer competitive multiplayer for up to four players (split-screen or online) the pickings are slim. The only modes are quick race (a one-off race) and Grand Prix (a collection of four events where players are awarded skulls after each event; most skulls wins). Not only are there only two modes but the events have been reduced to nothing but races, which excludes some of the game%26rsquo;s best offerings. Last, but certainly not least, is Raskulls%26rsquo; sense of humor. The entire Mega Quest plays out in a tongue-in-cheek fashion that is surprisingly funny. While some more cynical gamers might find it annoying, most will simply enjoy a laugh. Raskulls offers lots of great single-player content and the option to play only your favorite parts is a fantastic bonus. Add to that enthralling energy and an excellent sense of humor and Raskulls%26rsquo; single-player is a blast. Unfortunately, it can also be somewhat short and the multiplayer options are minimal. So if you%26rsquo;re looking for a few hours of completely unique single-player and a sincerely funny experience Raskulls might just be for you. 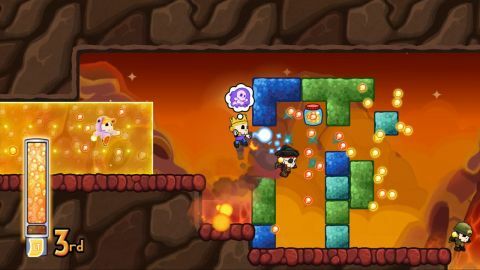 This Xbox Live Arcade title mixes platforming, puzzles and racing. Players must use their block-smashing wand to make their way through a level. It's a funny single-player experience with completely unique gameplay but unfortunately few multiplayer options.